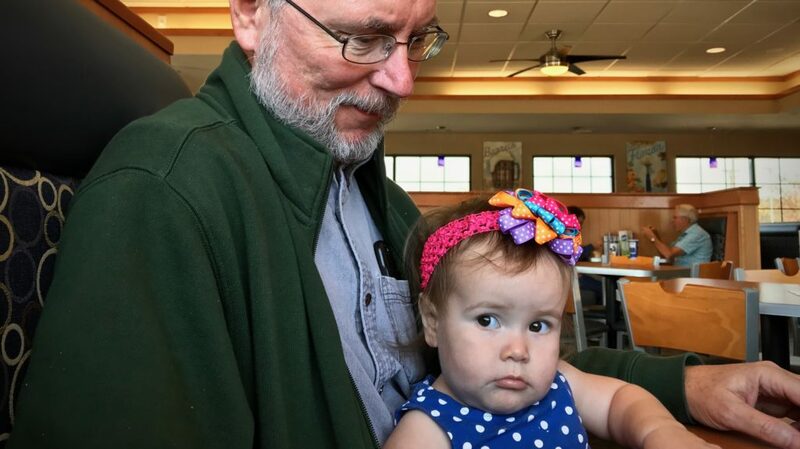 I started with a photograph of seventeen-month-old Lucia sitting in her grandad’s lap after eating lunch at Culver’s. Her pouty bottom lip and her serious brown eyes caught my attention. 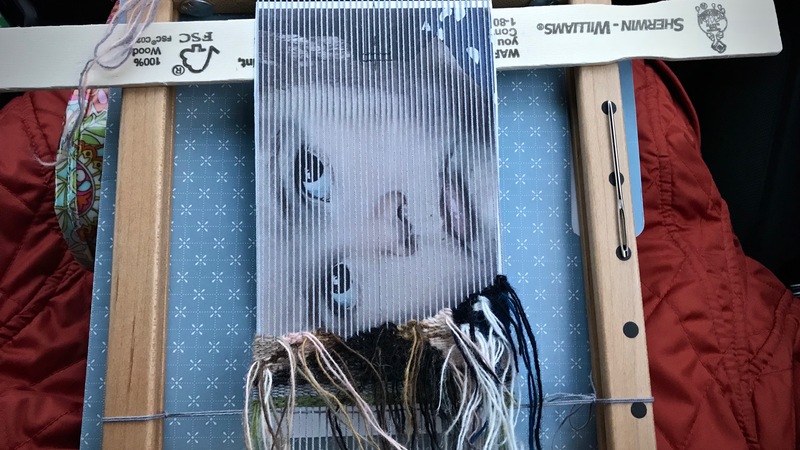 It seems an impossible task to replicate the charming expression in yarn, but it doesn’t hurt to try. 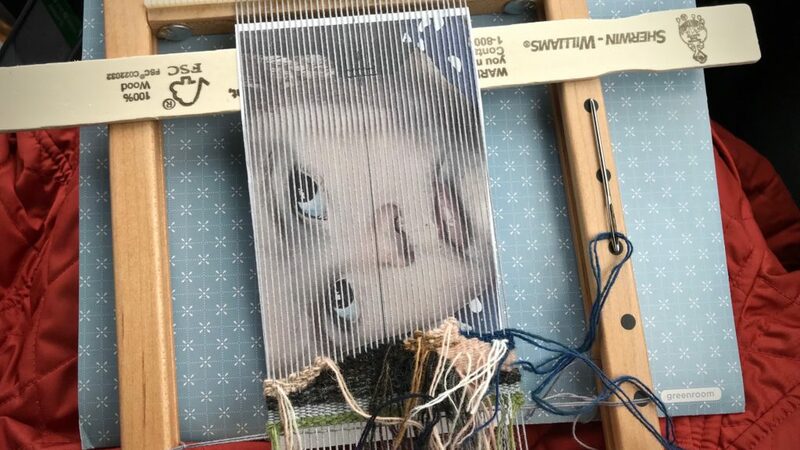 I enlarged the picture, and then cropped it to fit a four-by-six-inch “canvas” of 12/6 cotton warp. I also reversed the image, since I am weaving this tapestry from the back. 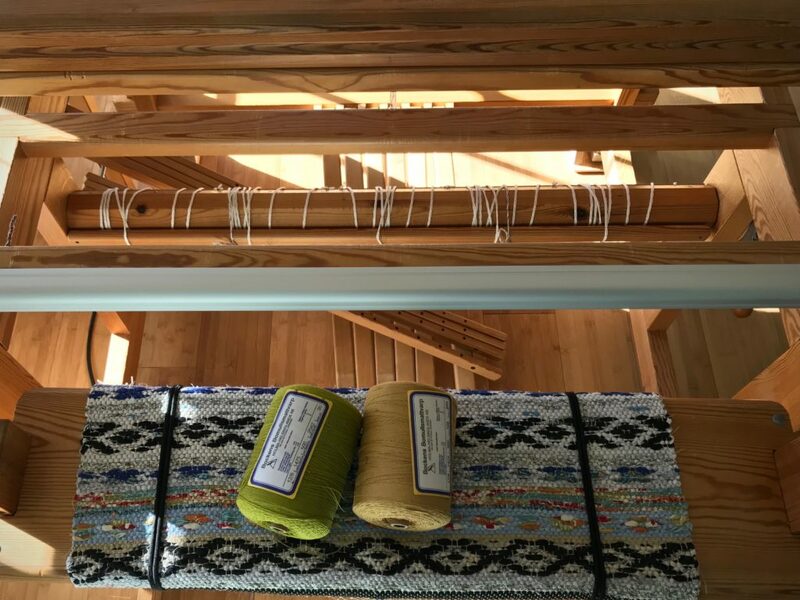 The weft is one, two, or three strands of Fårö wool yarn, depending on the degree of detail. Steve and Lucia enjoying each other. Here is my beginning attempt at a portrait, accomplished during our car ride home from Texas hill country, after spending time with Lucia and her cousins for the Christmas holidays. 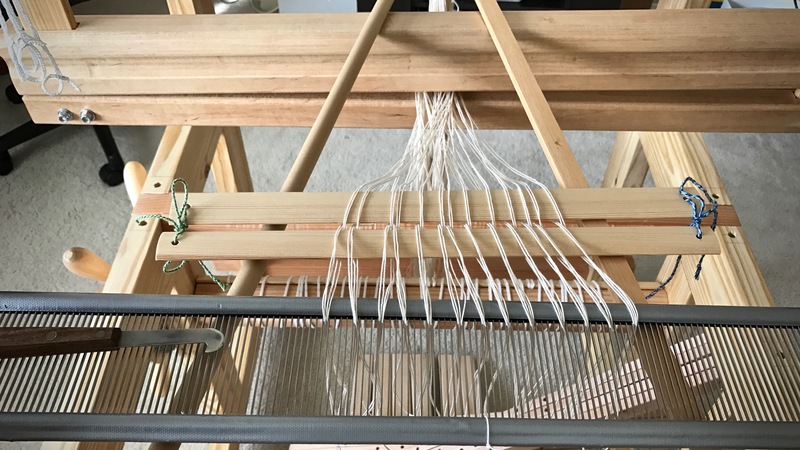 Loom is warped before hitting the road. Shapes are slowly filled in with yarn. Paint stick serves to hold the cartoon in place. 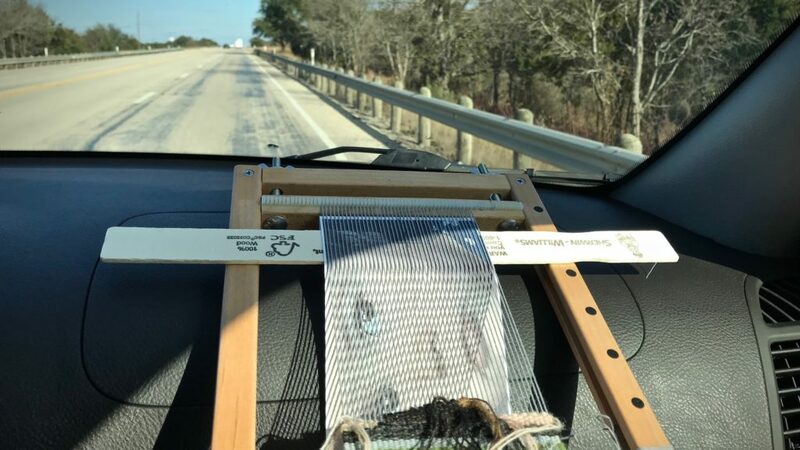 On the road with a little tapestry weaving. Beginning the blue and white polka-dotted dress. 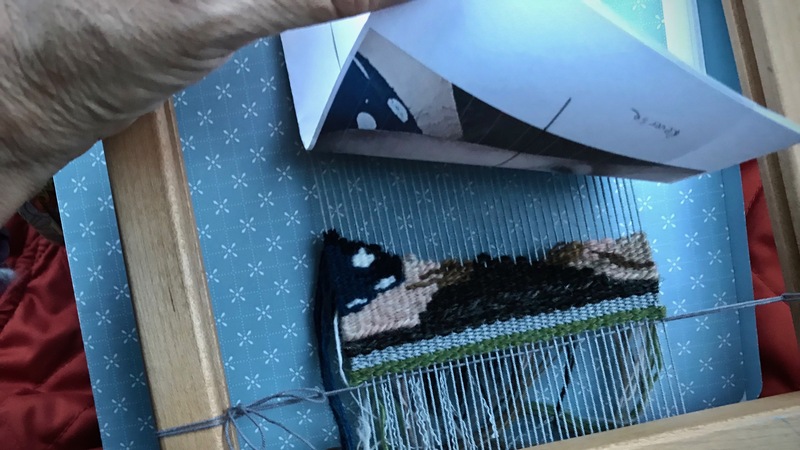 Inlaid magnets hold the blunt tapestry needle. Dusk has arrived, so it is time to put the weaving away for now. Good lighting is a must. Before putting the loom in the bag, I turn it over to look at the right side of the weaving. Progress! May you attempt the impossible. Wow! I can’t wait to see this progress. Hi Beth, Progress will be slow, but it will be nice to have this to work on in the evenings, little by little. She is lovely! I can’t wait to see what you end up with. Hi Liberty, Who knows how much she will age by the time I finish this. Haha. She may look completely different by then. Sweet Little Loom with a View! 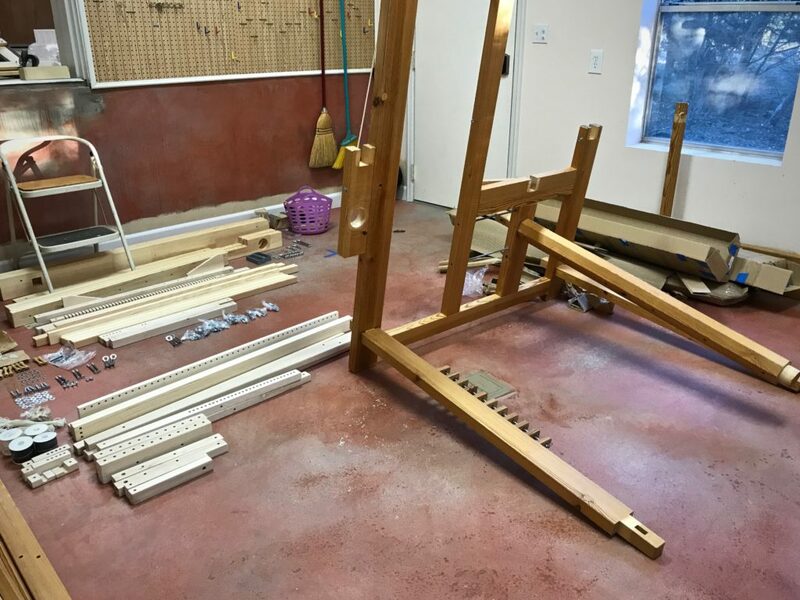 Steve thought I should have another loom, so he used his carpentry skills to build a 27-inch Swedish-style four-shaft countermarch loom! It’s beautiful. It’s incredible! In preparation for retirement in a few years, we found a place in beautiful Texas hill country to call (our future) home. For now, it’s a place to gather with children and grandchildren on occasional weekends. And a place to put a sweet little loom. Final Touch. Tightening the cradles for the top of the hanging beater. Putting on the maiden warp of 12/9 cotton seine twine. Loom is ready to be disassembled. Warp is wrapped up on the warp beam. Blue duffel bags will hold all the loom parts except for the side frames and the beater, to be transported to the new location. And it only gets better. 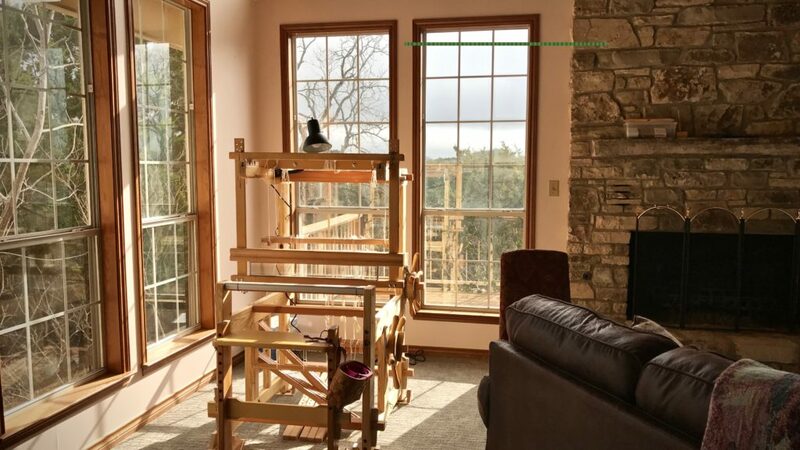 We situated the petite loom by the corner windows in the living room. At the loom, I have the best seat in the house, with an amazing view of God’s creation. The loom tells me my husband knows me very well. And the view tells me the Lord knows me, too. 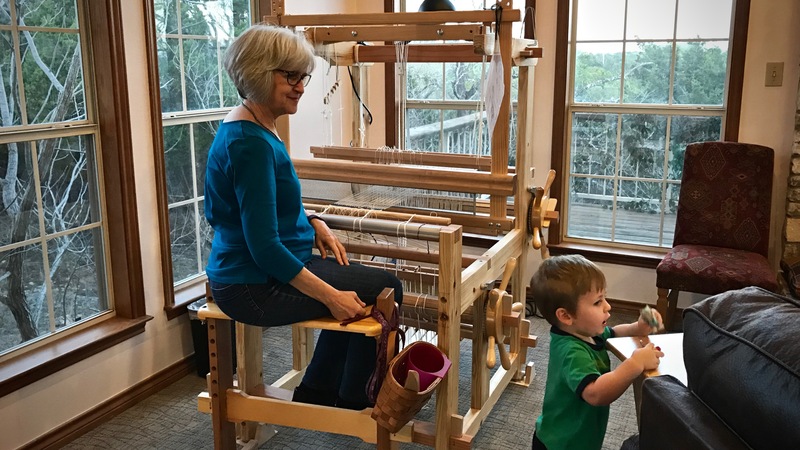 Threading heddles while enjoying the hill country view! Sweet little loom with a view! Heavenly! None of us can come to God on our own terms. Not by our wisdom. Not by our strength. Only through humility do we find God. Humility opens our heart to God. That’s when we see how much He has done to get our attention to tell us He knows us and loves us. 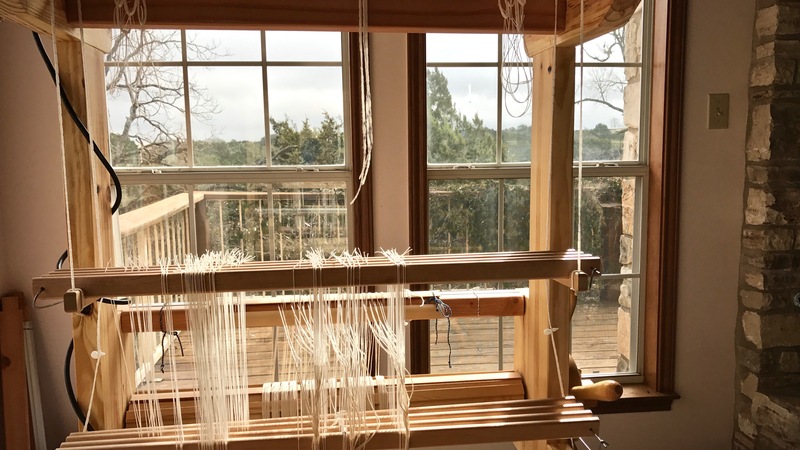 My special loom with a view is an example of what it’s like to be known and deeply loved. Beautiful Karen. An inspiring blog to exemplify how necessary it is for us to be grateful for the ‘simple’ things in life. My loom with a view has a delightful panorama of the Pacific Ocean on the east coast of Australia, south of Sydney. And today I picked up (another!) little sweet loom, a Louet Jane – for small delicate treasures. Hi Alison, It sounds like you enjoy a gorgeous setting! Yes, gratitude is essential, isn’t it? Hi Meg, It’s kind of you to say so. Thanks! Oh, my goodness! It is beautiful! Not only does your husband know you well, he obviously loves you very much. What a treasure. 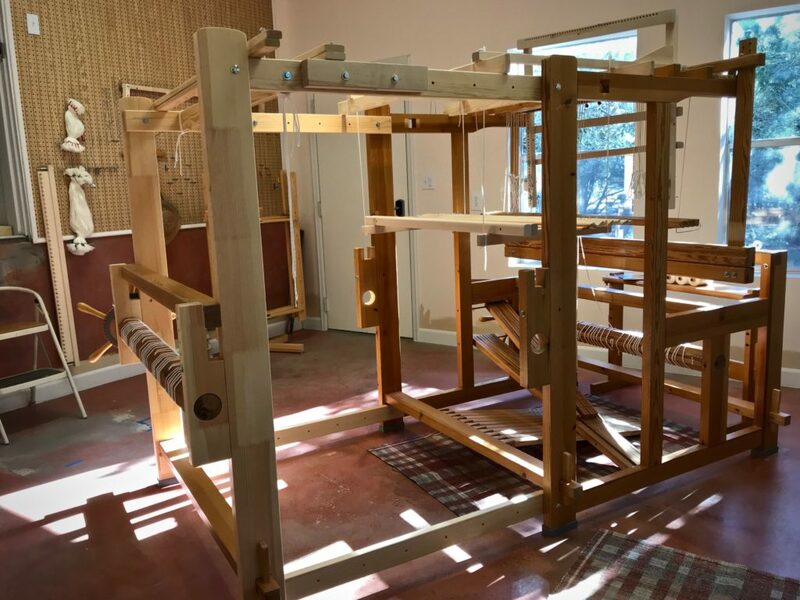 I look forward to seeing the first project from this lovely loom. Hi Beth, It is treasure indeed! 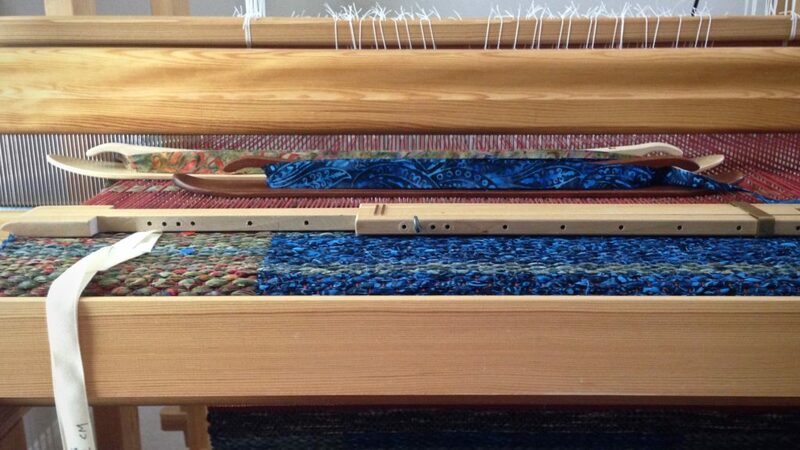 I have a project on the loom that’s been on my weaving “bucket list” for a while – a four-shaft tapestry sampler. Pictures coming soon. What a loving present your husband made for you! Enjoy your new petite loom with the beautiful view. Thanks, Martha! I will enjoy this special gift! 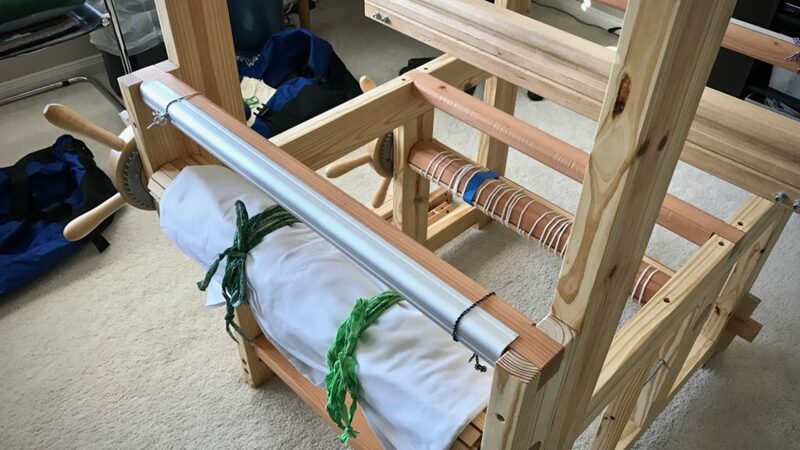 Oh my gosh, what a beautiful little loom, what woodworking talent your husband has. And yes, what a beautiful view! Hi Cindie, Yes, my husband is very meticulous and an excellent woodworker. 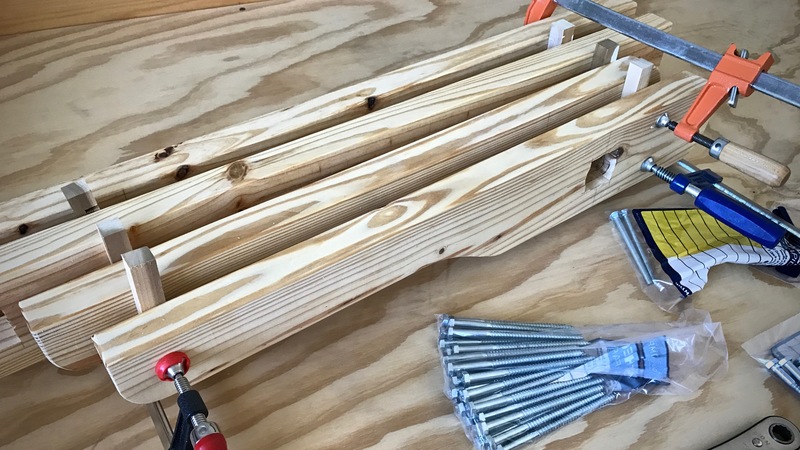 This was not an easy project–it certainly was a labor of love! This is SO cool! 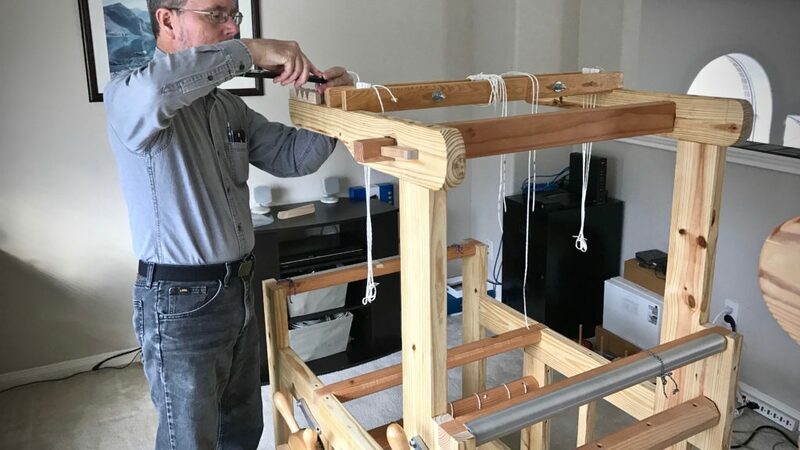 (I couldn’t help but think of the loom plans I found in my husband’s bookcase several years after his death…..and of all the weaving tools he could have made for me had he survived cancer.) 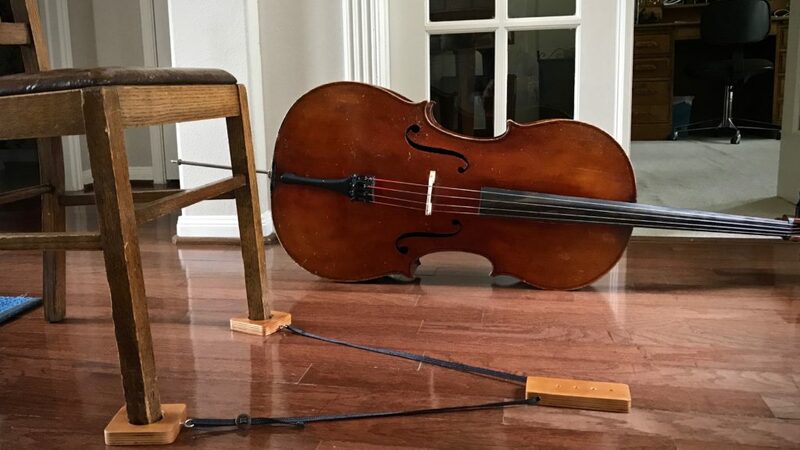 I love your setting, too….thanks for sharing this post! Dear Marcia, I see you know what it is like to be loved. 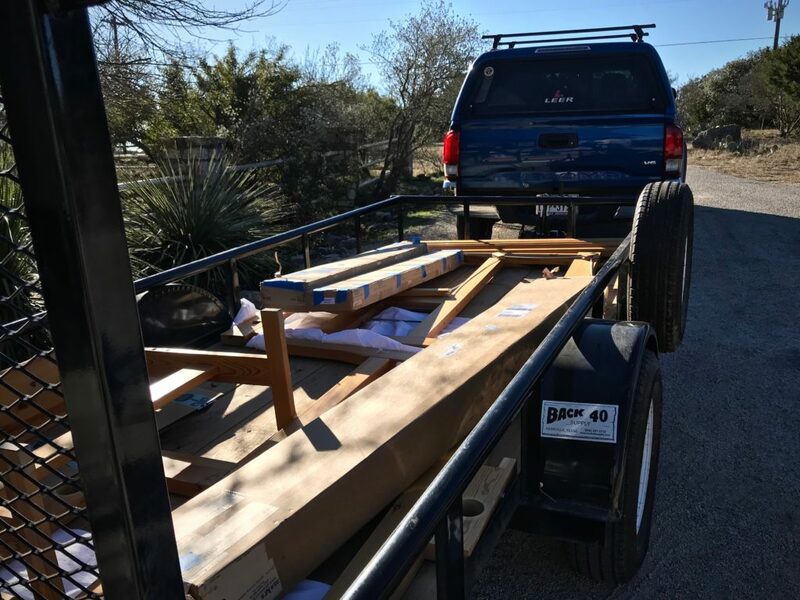 How sweet to find those plans… I’m sorry for your loss. I’m glad that this triggered fond memories – those memories are a blessing. A real dream come true for a weaver! 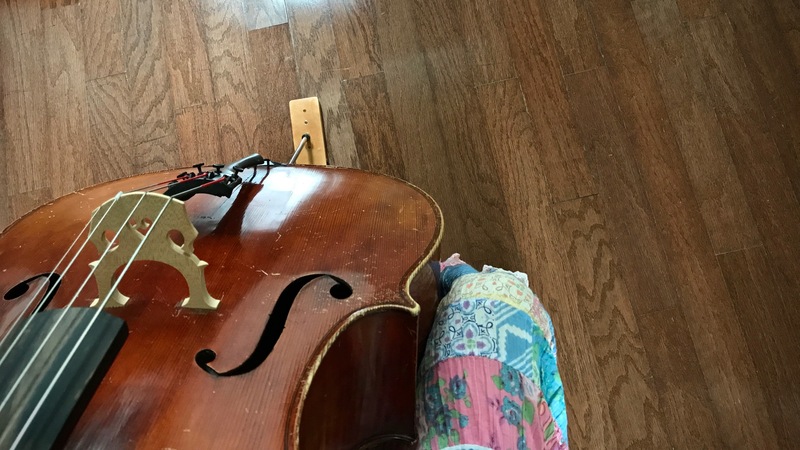 I am also very grateful for a studio that I enjoy and a husband who has given up his garage to allow me a place to enjoy the talents and use the gifts God has given me. 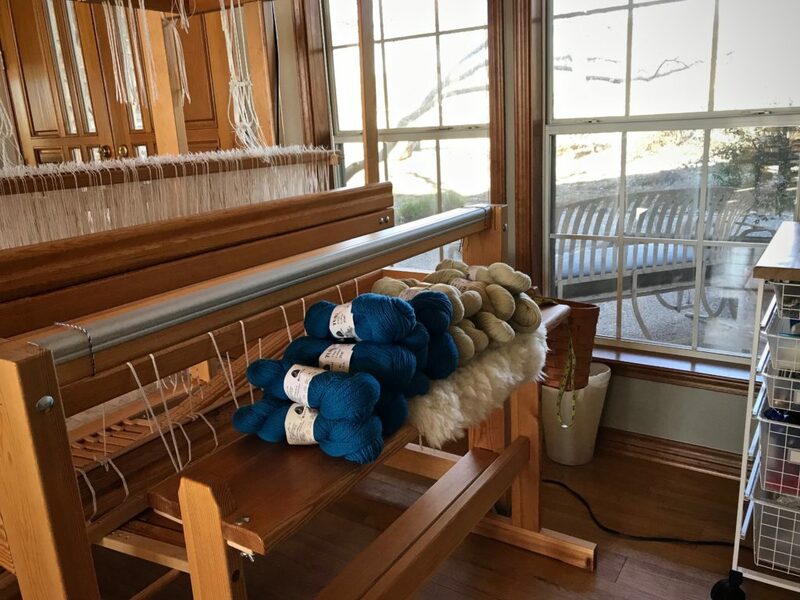 The view is not as wonderful as yours, but I am most grateful for it and now to be able to teach my granddaughter to weave, another to paint, and a grandson to crochet my heart is full. Hi Carol, The loving surroundings are every bit as important as the view. It sounds like you have a perfect space for using your gifts and pouring into the next generation! That’s wonderful! What a beautiful team you two make and this loom exemplifies this! And how beautiful of you to share the story like this! Hi Margaret! It’s great to hear from you. Yes, we are a team–companions for life. Nick W, back in college days, was the one who told Steve to aim for companionship in marriage. Best advice ever! Your Journey as a weaver is impressive and your willing to share in great detail is very much appreciated.I’m a new weaver and I’m learning a lot from your posts and videos. 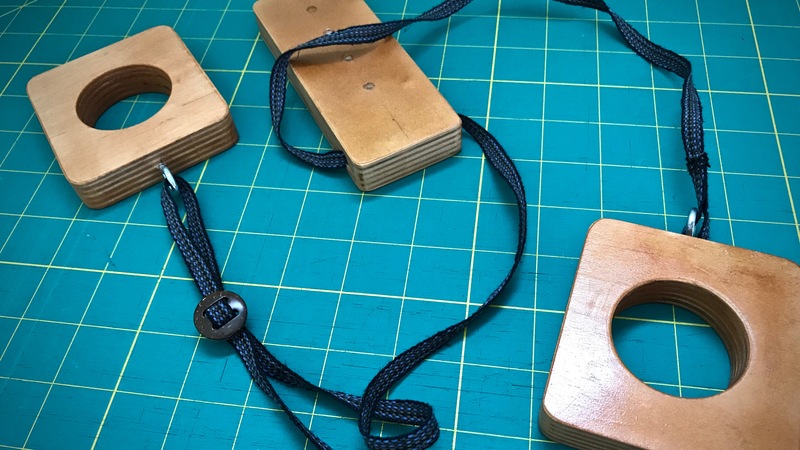 Are you going to use a book with patterns for your new a 4 shafts loom? Can you share your favorite book on weaving? 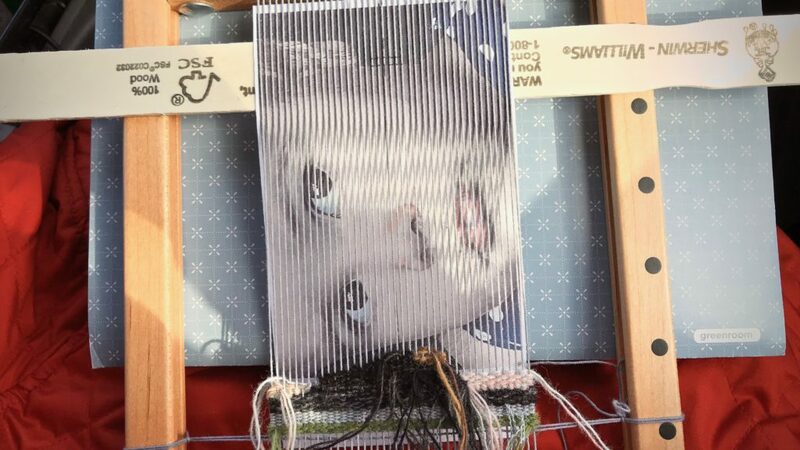 Hello Karen, I learned to weave at age 16. Then due to kids, job, life, i wasn’t able to weave for about 20. I am now able to weave again. YEA! It just makes me happy. I have looked a weaver’s blogs, all very talented weavers!! !, but like your the best and keep coming back to it. i admire the quality and creativity in your weaving and the fact you are a Christian. I am looking to use my weaving to augment my spiritual gift of encouragement. Thank you for the beautiful site and beautiful words. Melissa, I’m touched! It’s a pleasure to have you joining me here. Our world needs your gift of encouragement. I hope you soar with that!! I know you have encouraged me today. Thanks! It’s awesome Karen! I just came back from Lawrence, Kansas, and the yarn shop there is filled with weaving supplies. The tiny yarn shop in Grand Rapids has them too. Whenever I see the supplies, I think of you! Thanks for dropping in here! Very cute loom! Looks like a wee Glimakra School loom. Be sure to mark it with date and maker! BTW, the Shelburne Museum in Shelburne, Vermont has a very old chest of drawers with the names of all the owners over the generations carved into its top. We should all do that to our looms, maybe! Hi Shearling, It is much like one of those Glimakra School looms. If we could have found one of those, I don’t think we (Steve) would have needed to make one. Thanks for the thought about marking it with the date and name of the maker! We hadn’t thought of that. Will do! 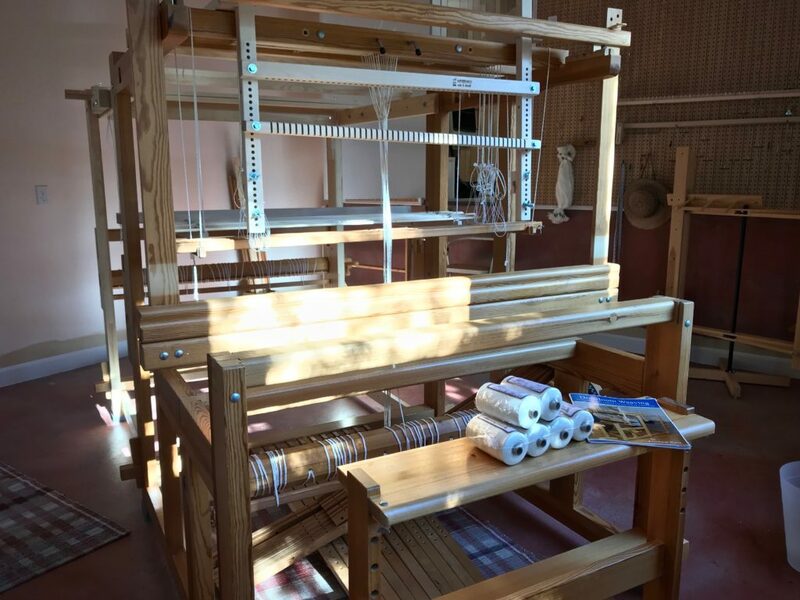 It would be great to have a piece of the history on the loom, wouldn’t it? Oh, the stories the old looms could tell. Patterned rag rugs always use at least two shuttles. I often have four or five filled ski shuttles at the loom. 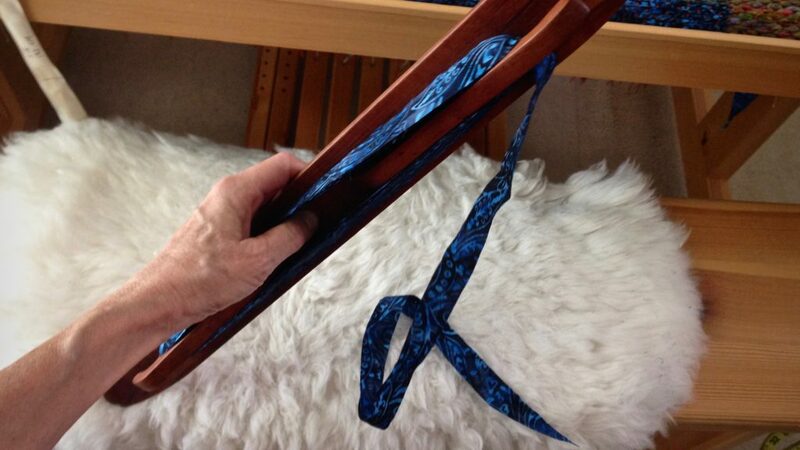 A low profile ski shuttle is an excellent choice for weaving patterned rag rugs. Why? It fits pleasantly in the hand. It holds a large amount of fabric weft without being bulky. The wide base glides smoothly across the warp. It is slender enough to send it out of the shed to go over or under outer warp ends, when needed. 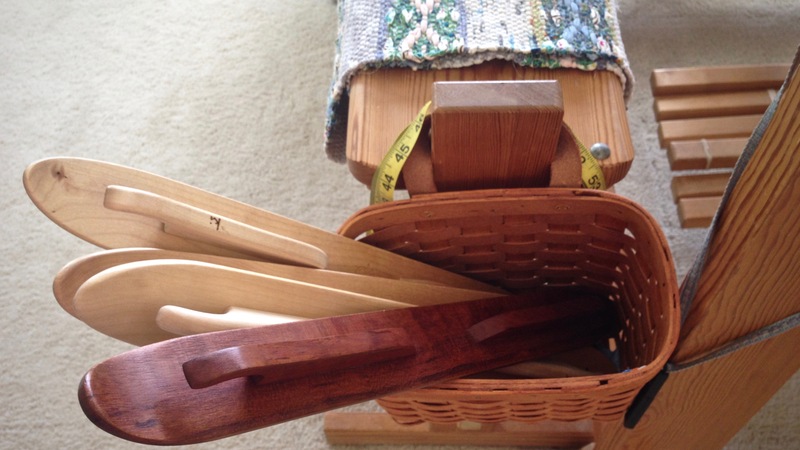 Basket of ski shuttles that are ready for the next rosepath rag rug! 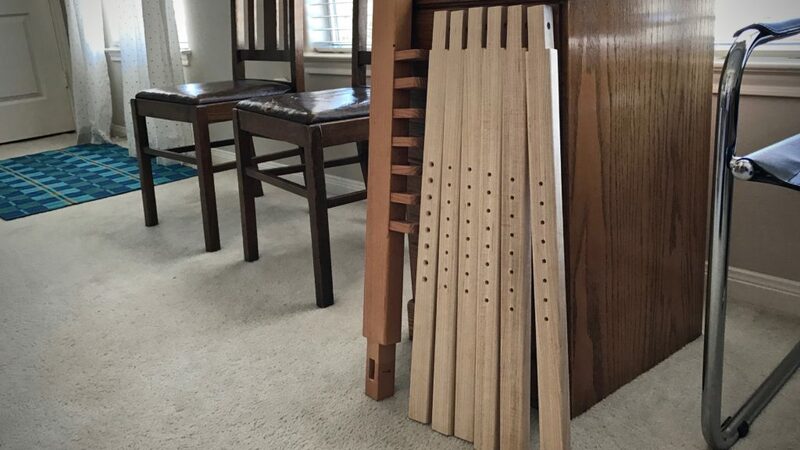 My ski shuttles are made by Glimåkra, except for the beautiful cherry wood ski shuttle my husband made for me. Newly completed rosepath rag rug is ready to be hemmed. Cherry wood ski shuttle is hand crafted by Steve Isenhower. Weaving width determines which ski shuttle length to use. The shorter shuttle works with any weaving width. 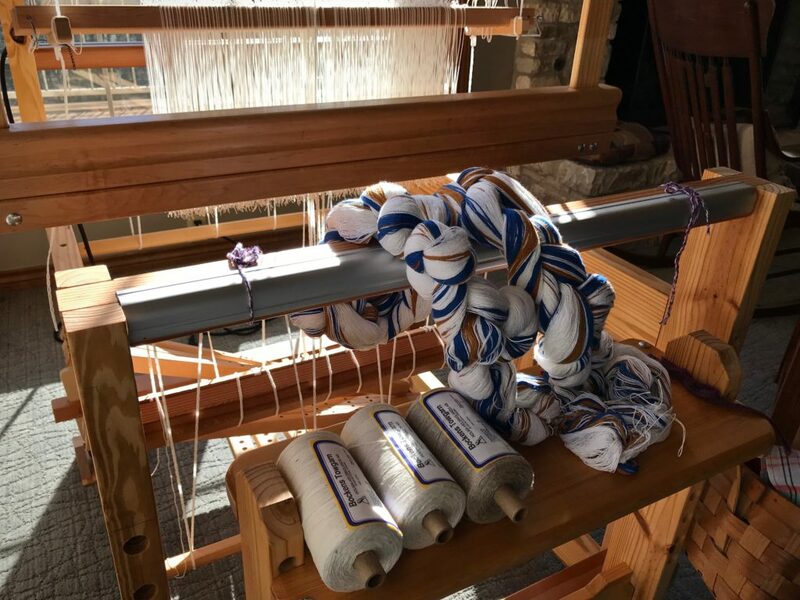 The longer shuttle works only for wider weaving widths (30″ or more) and for spaces with plenty of clearance at the sides of the loom. The low profile of the shuttles is seen in relation to the height of the reed in the beater. 1 — Hold ski shuttle vertically. Start with one tapered end of the fabric strip coming across the top of the ski shuttle. Hold the tapered end with your thumb while you start winding the fabric strip onto the shuttle with your other hand. 2 — Continue wrapping the fabric strip around the length of the shuttle, straightening the fabric as you go. 3 — Finish winding when you have a tail of fabric remaining. May your shuttles be a good fit for your hands. 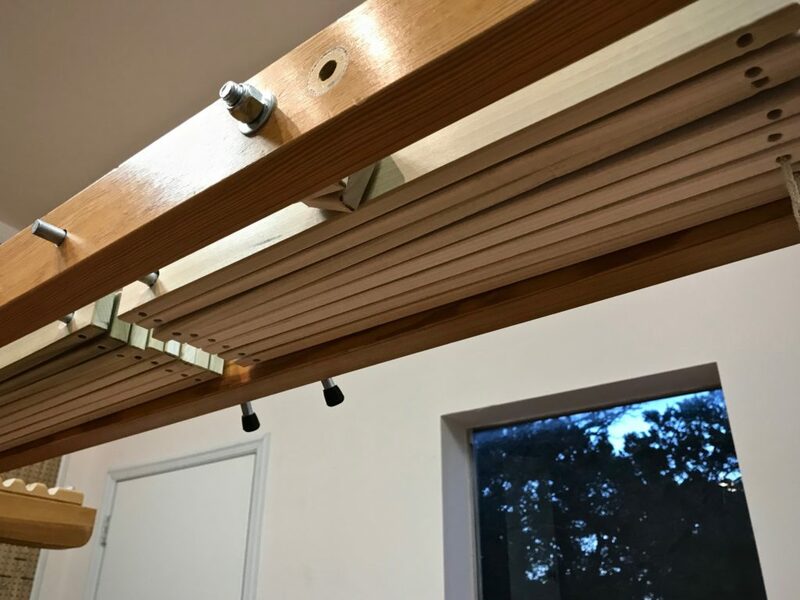 What a beautiful cherry wood shuttle your husband made. Giving a hand made gift is giving a part of yourself. What a loving gift. Cherry wood is a very hard wood. Perfect choice for a shuttle’s smooth durable surface. How wide is the fabric weft?I love the colors you selected for this rug. The cherry wood has a nice feel, too. I like holding it in my hands. The fabric for the rosepath rug is cut 3/4″ wide. 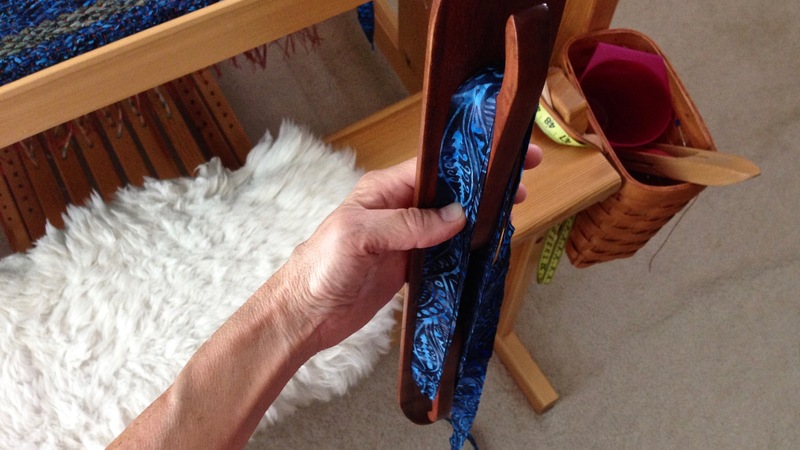 The batik fabric for the double binding rug is lightweight, so I am cutting it a little wider, about 7/8″ wide. I really appreciate your tips, Karen. Are you weaving with a single strip of fabric as opposed to two strips? If so, why? 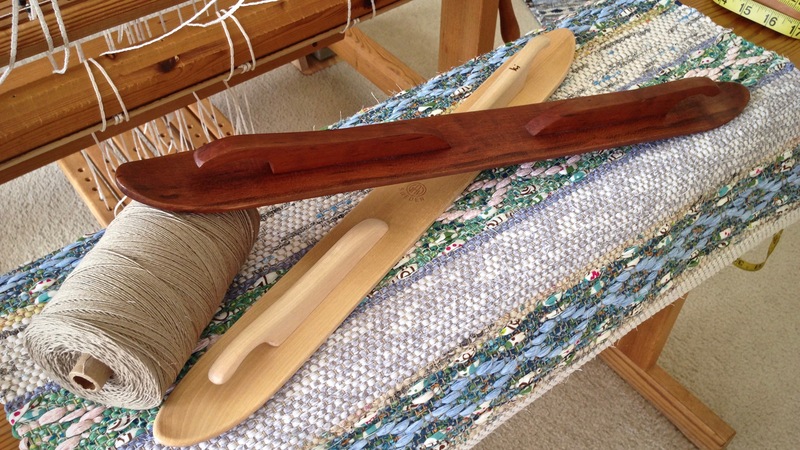 The double binding rug is two layers thick, so using one weft strip on each shuttle makes sense to me. Your rugs are gorgeous and whatever the draft is, makes the rug look so sophisticated! And it looks fun to weave. 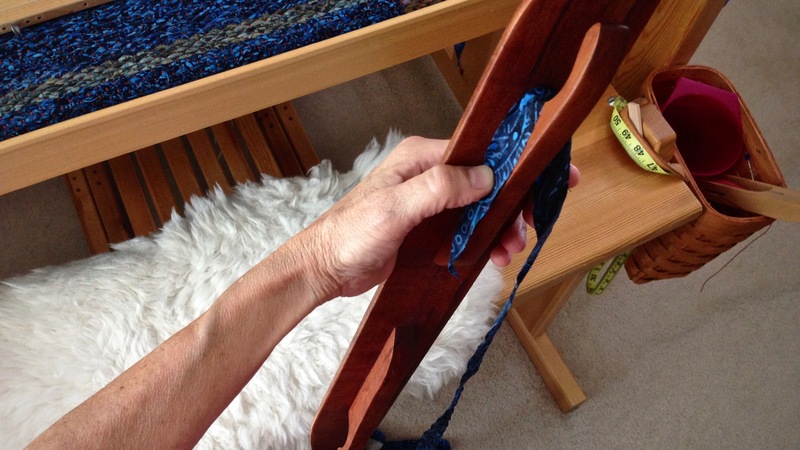 I don’t really understand what a double binding rag rug is and what the threading is…. Double binding is very fun to weave. 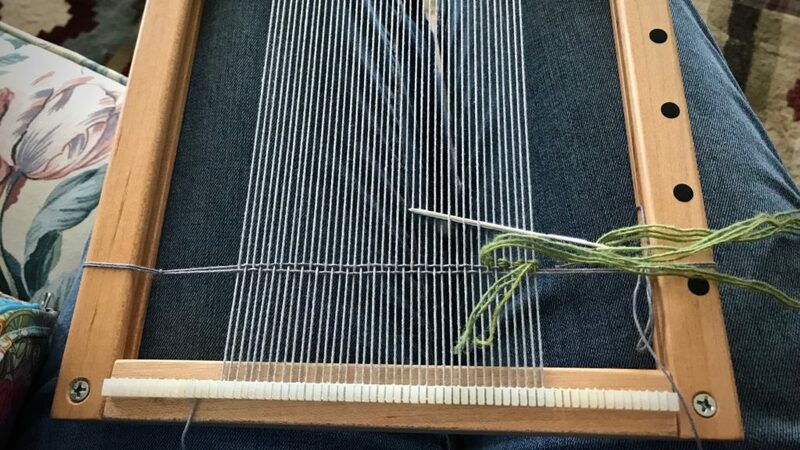 There are two layers being woven at one time. First, throw a pick for one layer, and then throw a pick for the other layer. It feels like magic every time you beat the two layers together. 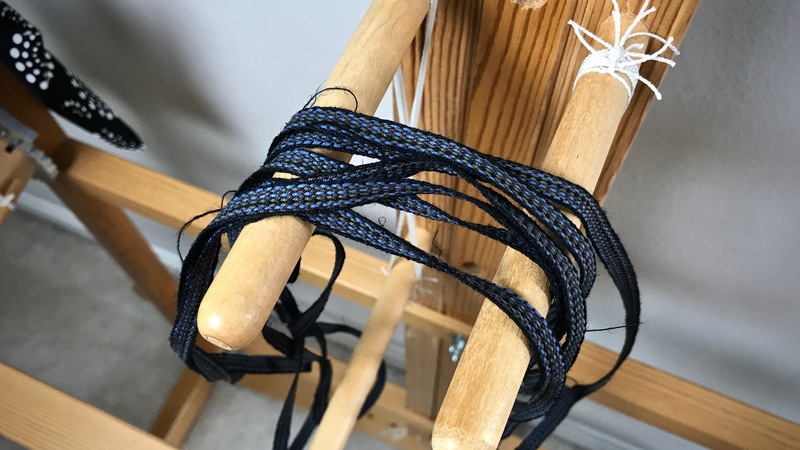 I listed some resources for double binding in my response to Maggie in the comments at the end of My Favorite Thing to Weave, if you are interested. Thank you! I just ordered The Big Book of Rugs (sounds like a children’s Golden book title!) and am looking forward to figuring out what you are doing. The other example of double binding in the book is “Checked Fabric,” p.96, and they call the weave technique “Reinforced weft weave structure,” but it is actually a simplified double binding structure. You can use that draft to weave rag rugs if you adjust it to 8 epi and use fabric strips 3/4″ wide. Arrange the two blocks as you please. I have done many rag rugs with this draft. HI, Karen, thank you so much for all the tips on weaving! Your rugs are beautiful! Do you usually use 12/6 cotton rug warp for your rag rugs instead of 8/4? Just learning! Thanks so much! I only use 12/6 cotton (Bockens) for rug warp. I like it because it has high twist which makes it very strong and durable. This makes it an excellent choice for rugs, hopefully giving them as much longevity as possible. Thank you so much, Karen! I’ll definitely try it when I weave a rug, hopefully pretty soon. Thanks again!